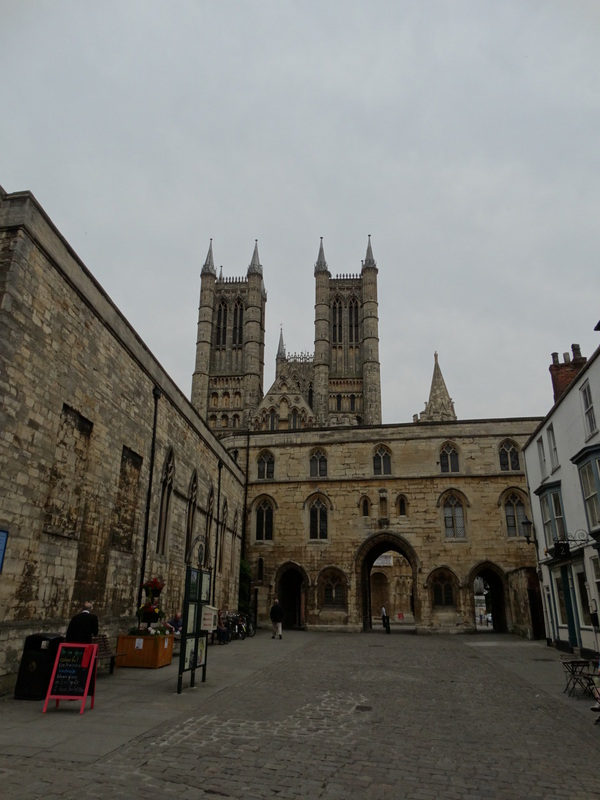 Julie and I lived in Lincoln for the three years I was training at Lincoln Theological College – as you stand on Castle Square facing the Cathedral (photo above), our house was 2 minutes walk to the left, the College one minute to the right. It was a smashing three years. Harry was born shortly after we arrived, so we had three small children. I did not work particularly hard as a student, and we spent a lot of time exploring the County, visiting churches, signal boxes and windmills (what else do you visit?). 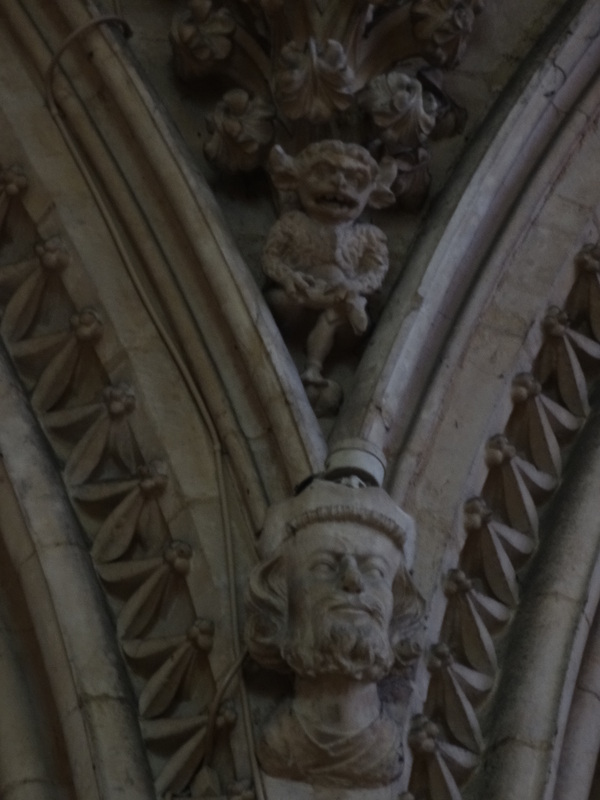 We loved Lincoln as a city – good shops, lots of history, nice churches, signal boxes and a windmill. We had a great house right at the top of the hill, and a view of the floodlit Minster from our bedroom window. 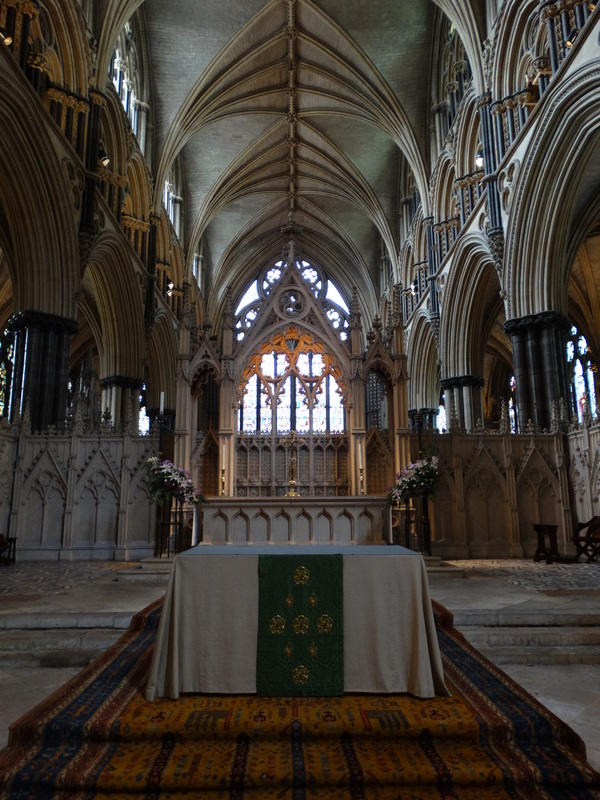 We were part of the worshipping congregation of the Cathedral – the family were welcomed to the main service on a Sunday morning, and there were many other opportunities to worship during the week. 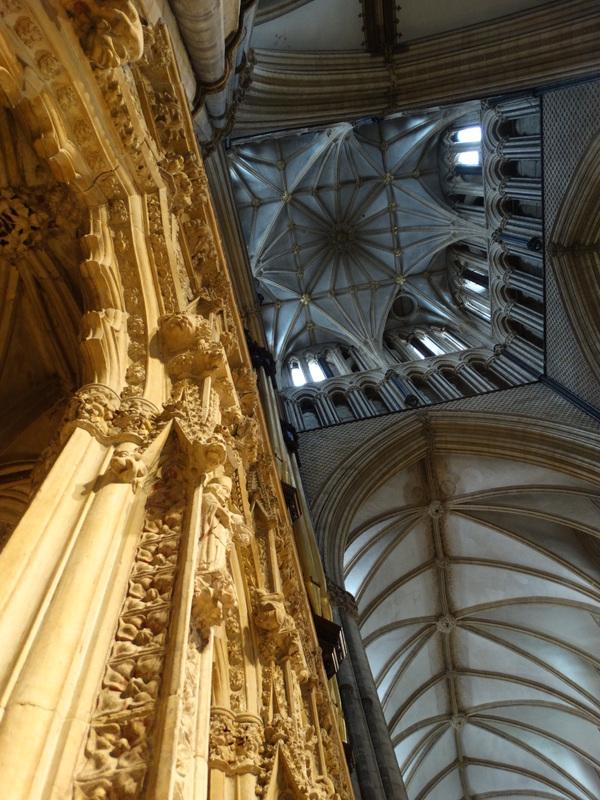 I did the tower tours, the roof tours, both of us sang, Julie’s voice (and several hundred others) can be heard on the CD “Angel voices”, on sale in the Cathedral shop. 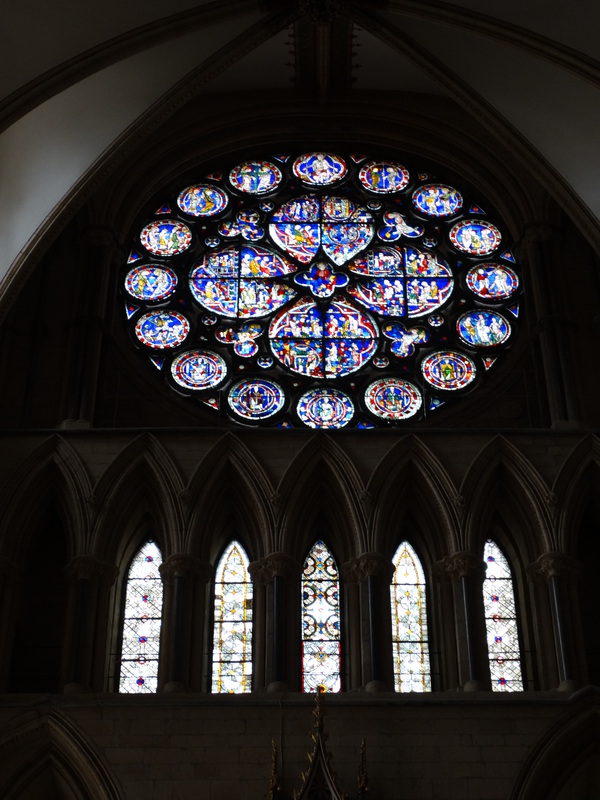 We were there during a difficult time of the Cathedral’s life – clergy relationships at rock bottom – but the stability, beauty and faith of the place was (and remains) an inspiration. 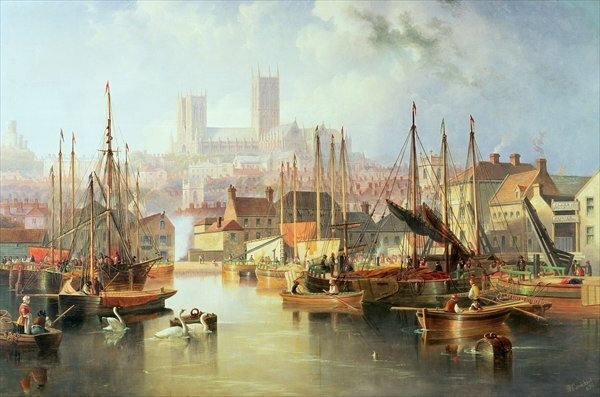 This picture was painted by John Wilson Carmichael – Lincoln Cathedral from Brayford Pool. We visited on Wednesday 2 July with our friends Rob and Anne (friends who have been with us through difficult times). They know the place a bit – our daughters’ have both sung here – and we enjoyed showing them somewhere so special to us. There is a fee to enter the Cathedral (unless you come to pray or to a service), and Rob got in as a concession (there are benefits of being 60+). We weren’t there at the right time for the tower or roof tour, and Wednesday is the choir’s evening off. I hope these photos bring over a wonderful place – if you haven’t visited, it should be on your list. Their website is superb – especially the “Who is this Jesus we keep talking about?” piece about our faith – the guidebook is brilliant, and comes with its own “Interactive tour” dvd. 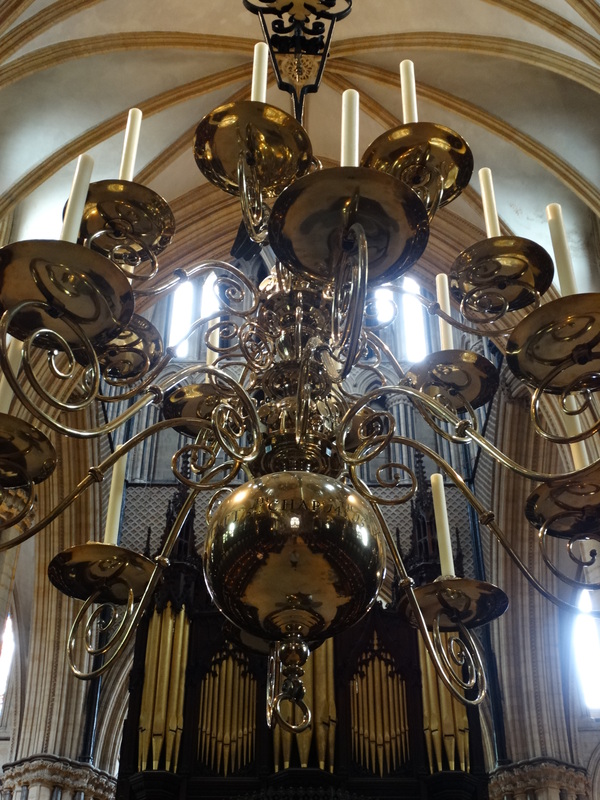 (Lovely sections on “Why do people come?” and “The Living Cathedral”). If you were fascinated by the labyrinth at Wakefield, why not go for the Lincoln Labyrinth Festival 6 to 27 August this year? – see their blog. If I do manage to go back, I’ll blog about it too. 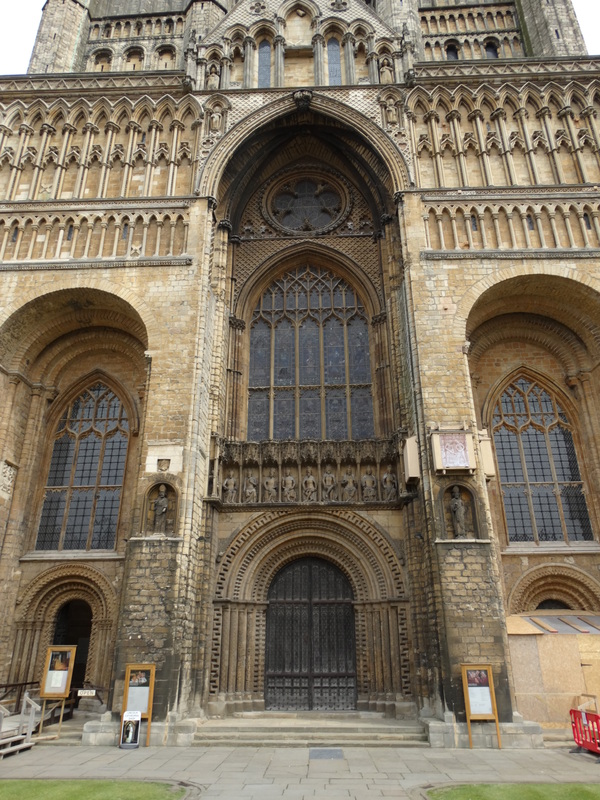 You can see the outline of the original Norman church in the West Front (above). After the Battle of Hastings the Castle and Cathedral were built to consolidate Norman control of the North – with the Benedictine monk Remigius as the first bishop. 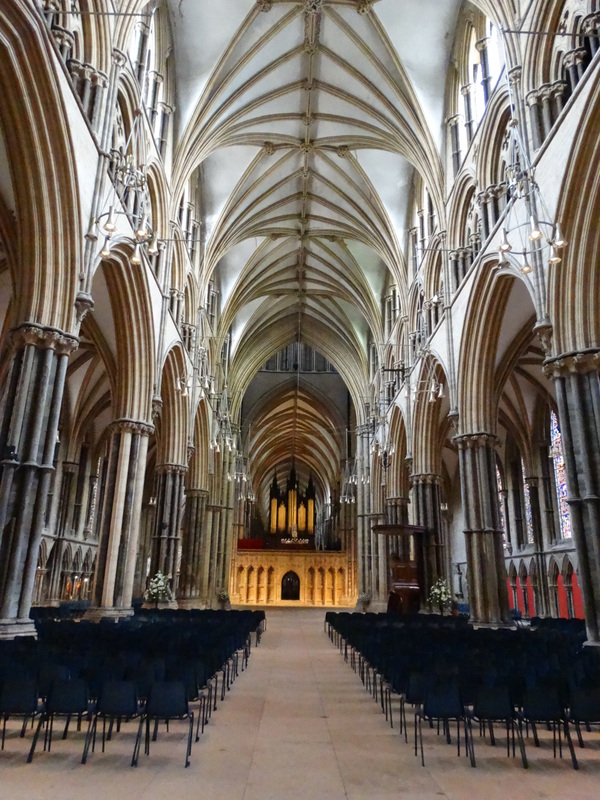 He didn’t set up a monastery of monks, but a Minster – a Cathedral which served the area. The building was consecrated in 1092, just after Remigius’s death, then the country was plunged into turmoil by the civil war between Stephen and Matilda. 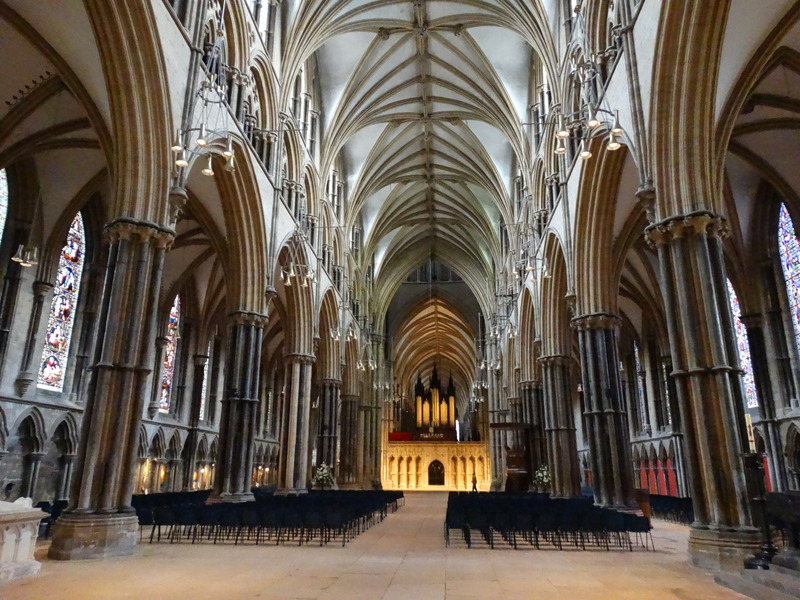 The cathedral was partly destroyed by fire in 1141, and rebuilt by “Alexander the Magnificent” (Bishop of Lincoln 1123-1148). The frieze of biblical scenes and the magnificent west door date to this time. 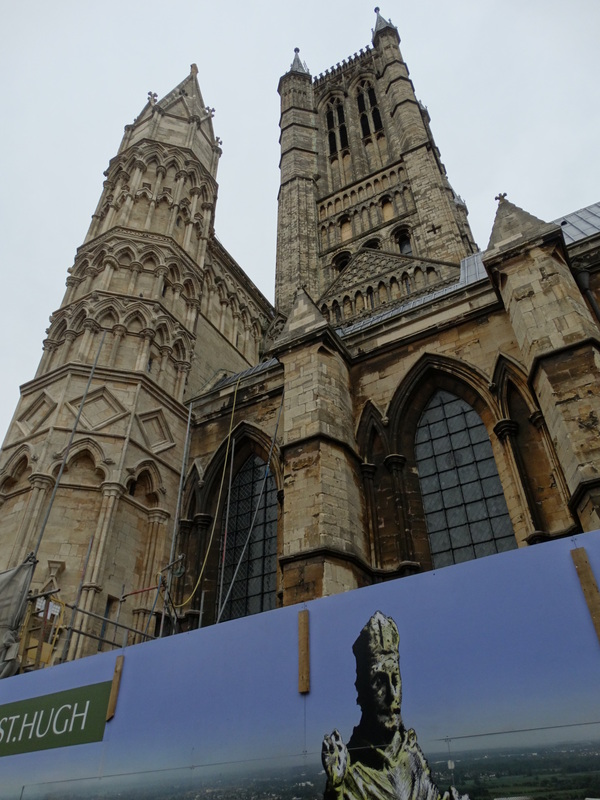 I am annoyed with myself that I failed to get a decent picture of the frieze, but I did manage photos of the photo-montage round the south west turret, where they are working. 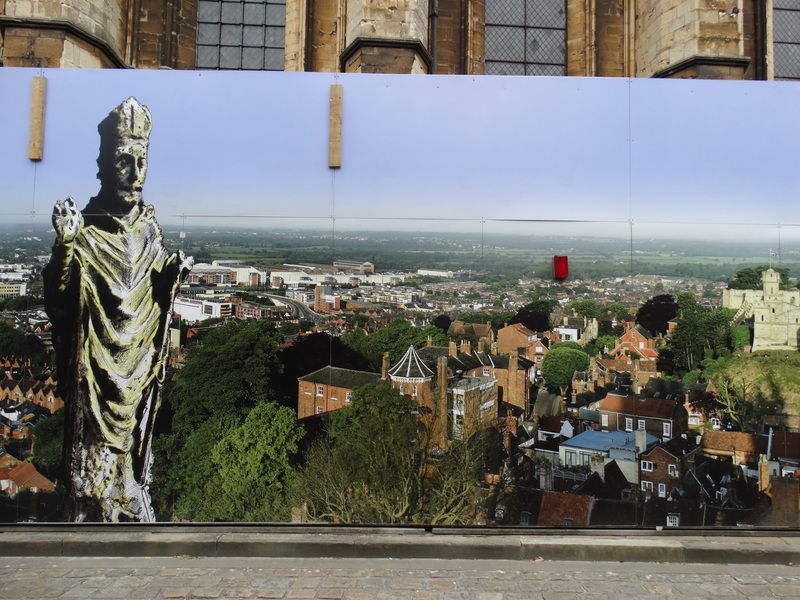 (Soon the work will move onto the north west turret – and that hoarding will be decorated by art students from the University (brilliant)). The building with the funny shaped turret was the Theological College (now Chad Varah house of the College of Art and Design). I am annoyed with myself that I failed to get a decent picture of the door. At the end of one College year I was Crucifer and led the procession from College to Cathedral. I had been assured that the west door would open for me. I was about 3 yards away, wondering what I would do if it didn’t, when the door swung open and there was a stunning view into the nave. One of those moments I will never forget. 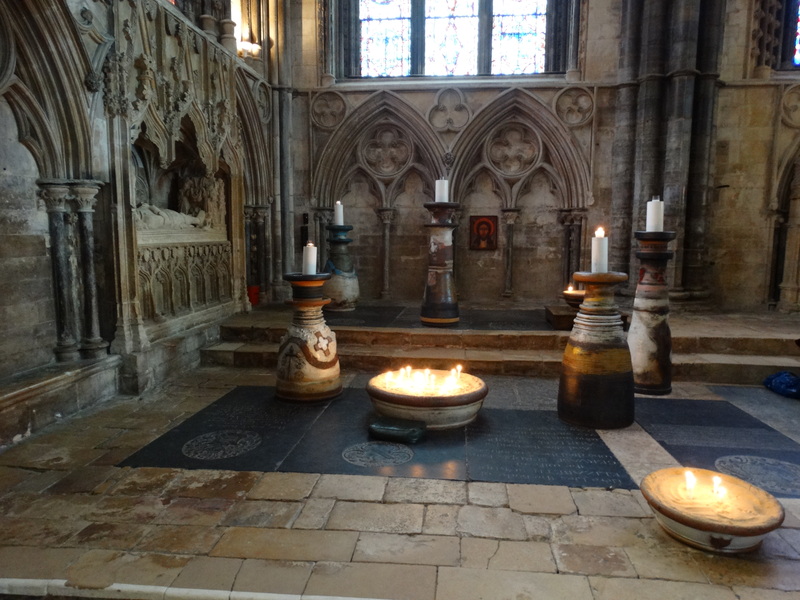 The Nave is Early English 1190-1250. On the left is the Stations of the Cross – see the next blog. 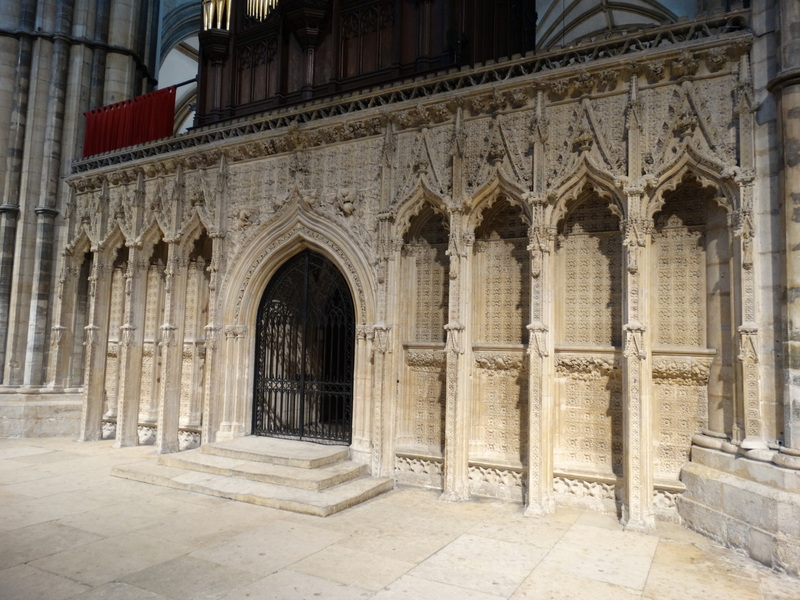 The Choir Screen dates from the 1330s, rebuilt after the central tower collapsed. Once it would have been coloured – blue for heaven, red for earth; this is a meeting place. The organ is a Father Willis of 1898. I have page turned in the organ loft. 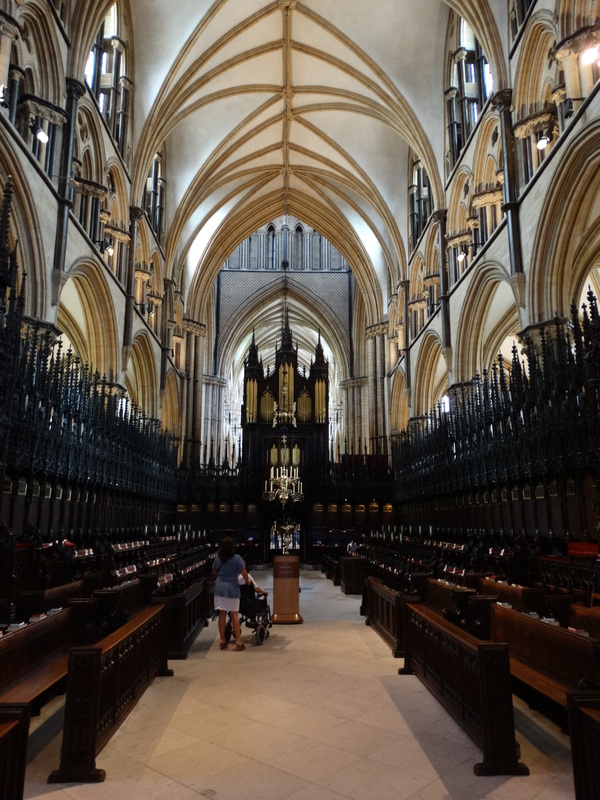 (There is a wonderful CD, recorded in the Cathedral by Nigel Ogden, called “Moonlighting” which includes “Barwick Green” by Arthur Wood, the Archers’ signature tune). St Hugh’s choir is stunning. I have sat here for many Evensongs. The first one I went to, when I had little understanding of how Cathedrals worked, was on a Sunday when they were installing the Chaplain of the RAF as a Canon. 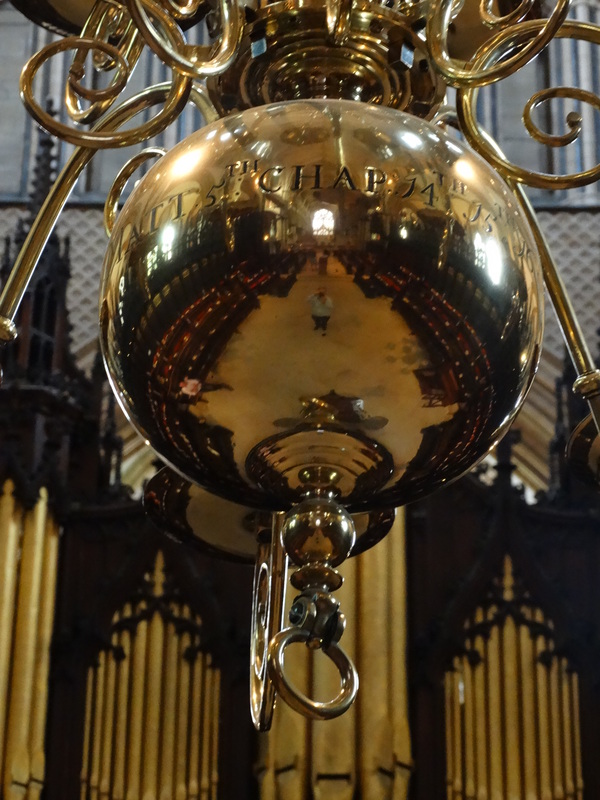 There was a line of RAF trumpeters standing along the altar rail – as they played the hairs on the back of my neck stood on end. It is on http://www.youtube.com/watch?v=x0hvizFZf5Q sung by the choir of King’s College Cambridge. We used to go in on a Friday evening as a College. The canons would decide on the way in who was reading, and one evening Bill, our College Warden, got a stinking piece of Genesis, full of hideous names. His expression said “if any of my students so much as snigger there will be trouble”. We returned to College for supper. Bill always had a half from the bar. That evening there was a pint waiting for him. 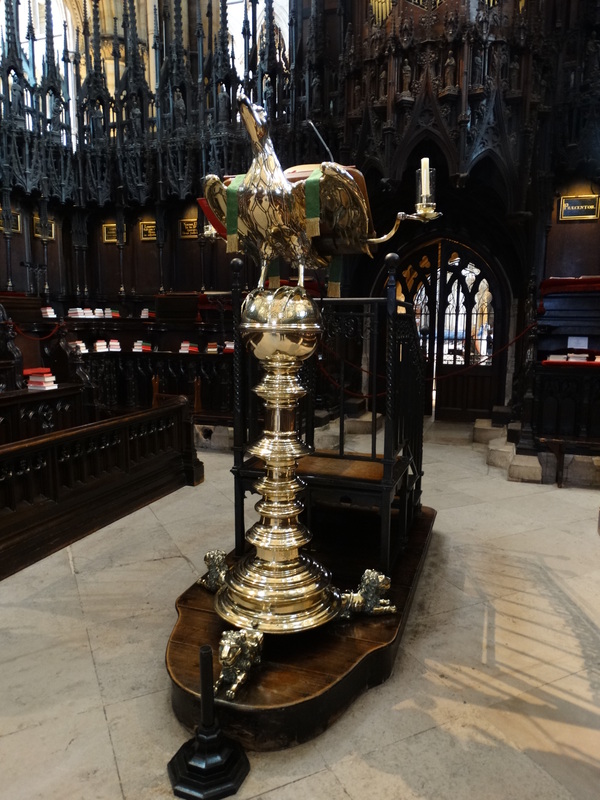 The Canons have their stalls here – each one labelled with their title (usually the place in the medieval diocese which provided the income). This was a huge diocese, stretching from the Humber to the Thames. They also say a psalm or two daily, so the first line of their psalm is written. 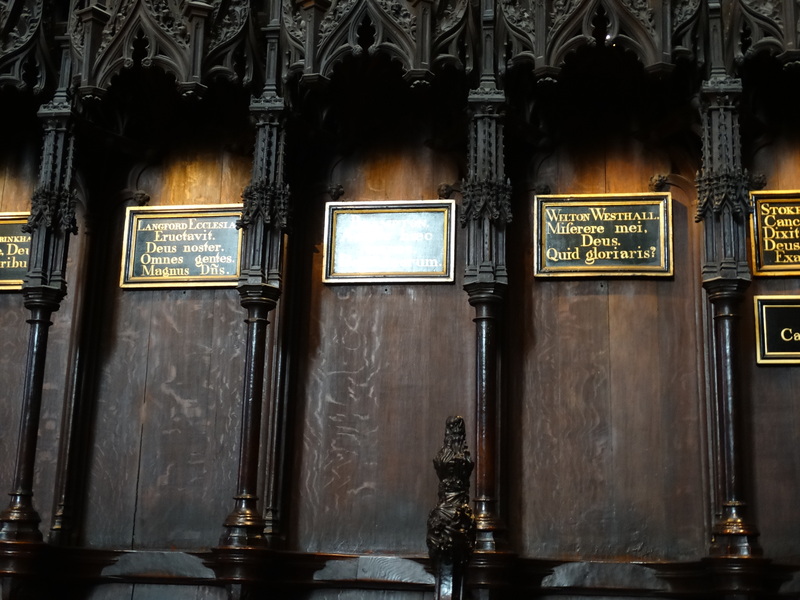 Every day at Evensong the prayers include “members of this Cathedral Chapter who died on this day in years past”, and you get quite a few names of people you’ve heard of from history. There is also one chap who I’m sure was “Prebendary of x, Vicar of y, and Chaplain to Butlins”. 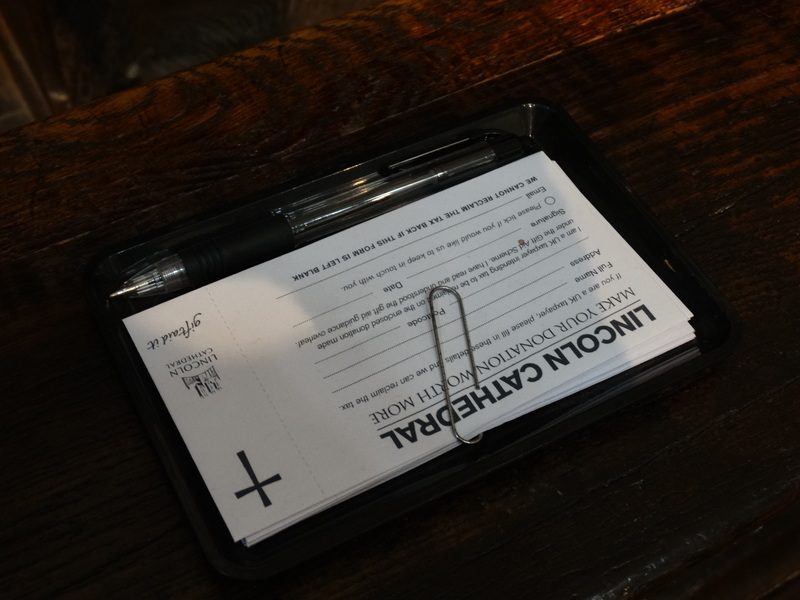 They also have discrete little plastic trays on the pews with gift aid envelopes and pens – I wonder if this might be easier than the confetti of envelopes that spreads itself across the floor in St Mary’s? 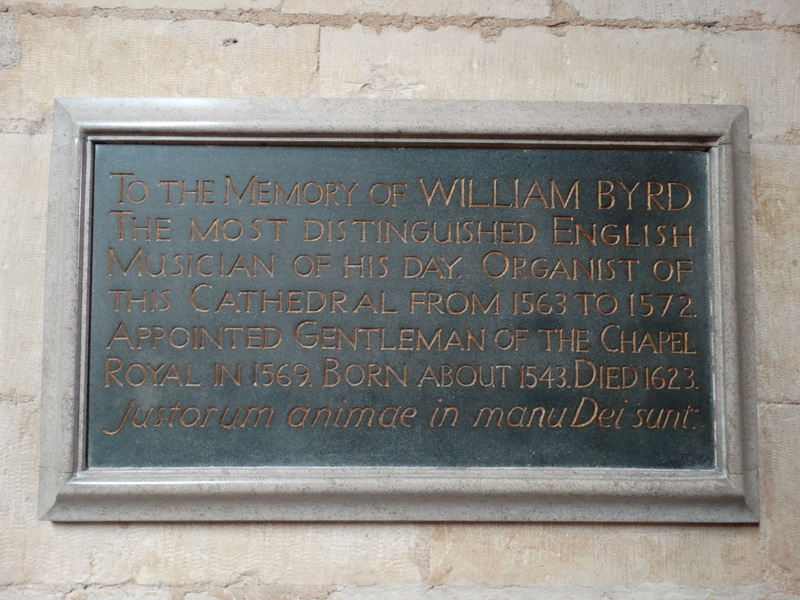 A memorial to William Byrd, one of many musicians to serve this place. 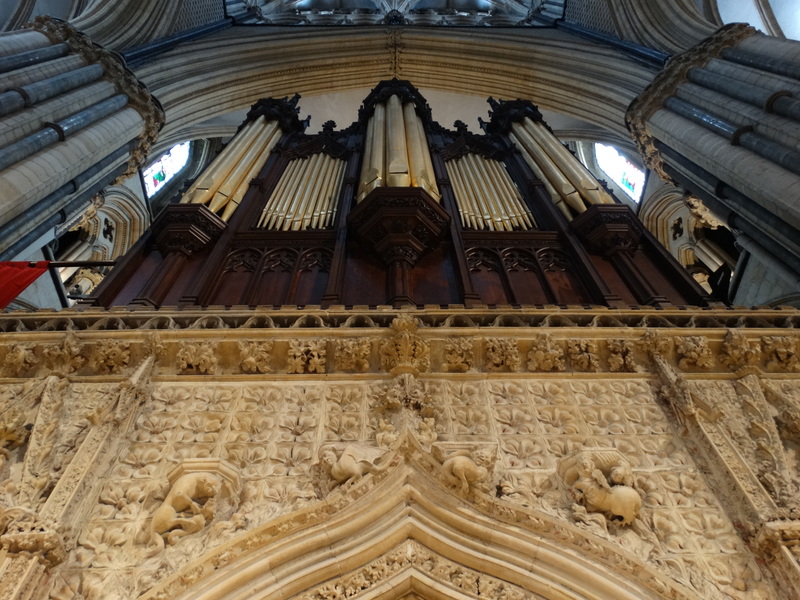 The Angel Choir was built to hold the tomb of Hugh. 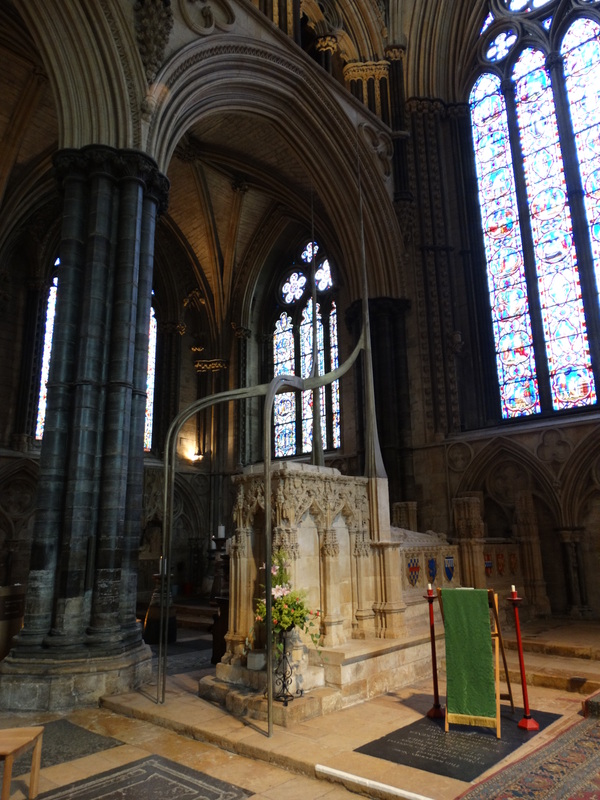 He became bishop in 1186, the year after an earthquake has damaged the Cathedral, and is remembered for his pastoral care, his holiness of lifestyle and his habit of standing up to kings (including Henry II, Richard the Lionheart and King John). 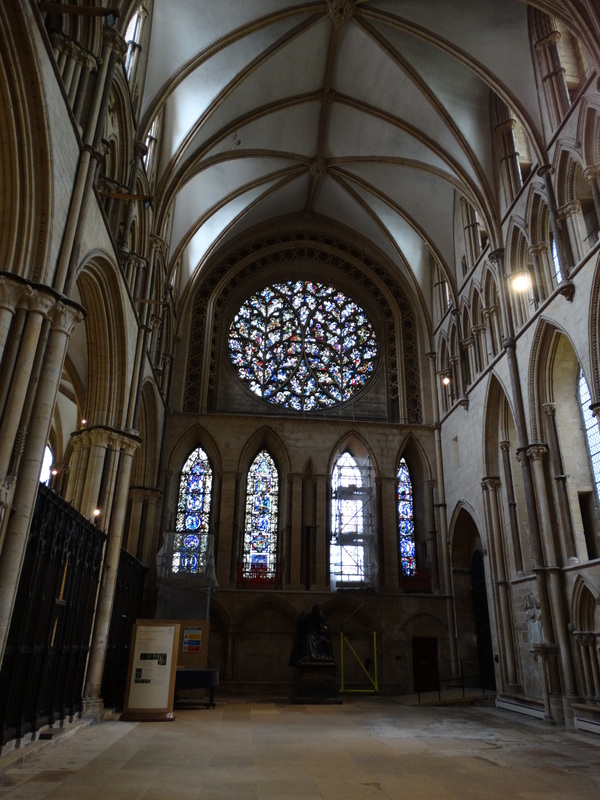 The transept and nave are his work (well, I don’t suppose he did it personally). When he died in 1200 it only took 20 years for him to become a saint. By 1255 there were so many people coming to his tomb that they extended the east end to cope! 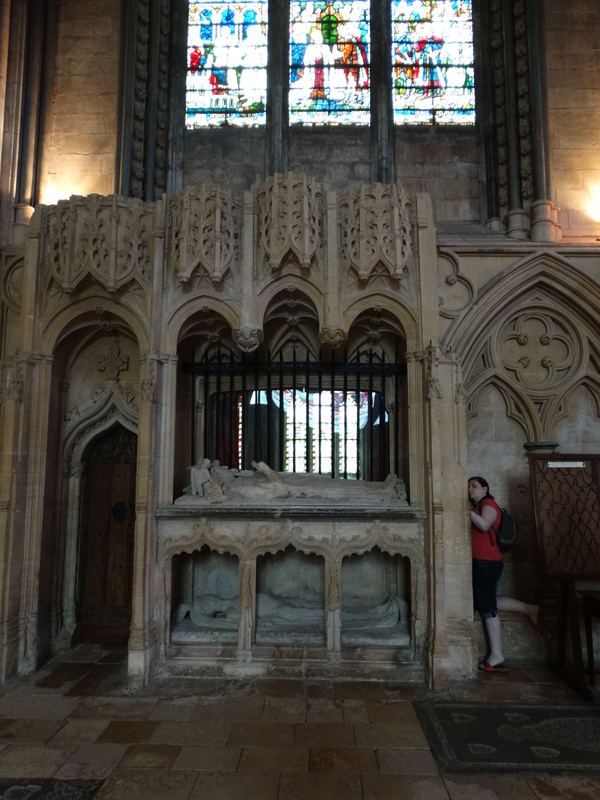 His body was translated to a new tomb on 6 October 1280 at a magnificent ceremony attended by Edward I and Queen Eleanor. 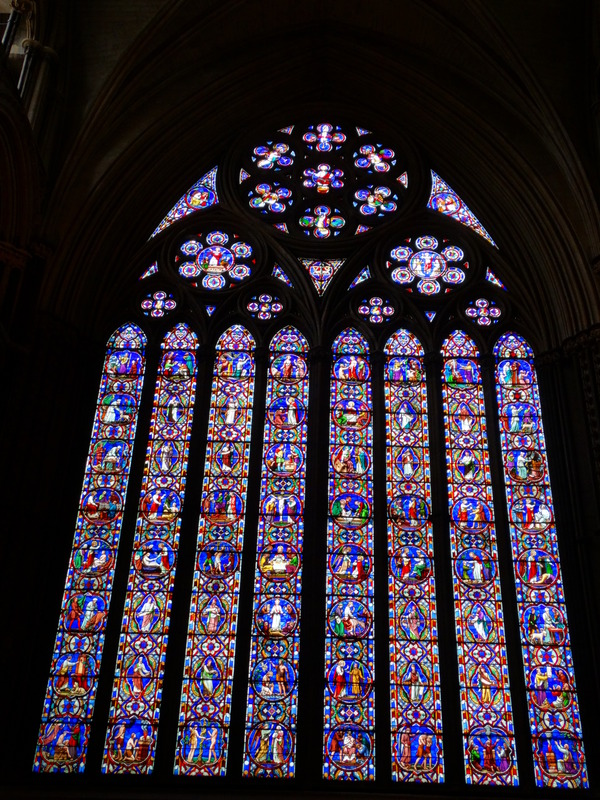 The East window is 1855 stained glass, and the Lincoln Imp looks down on the scene. I have always liked these pots/candle stands. 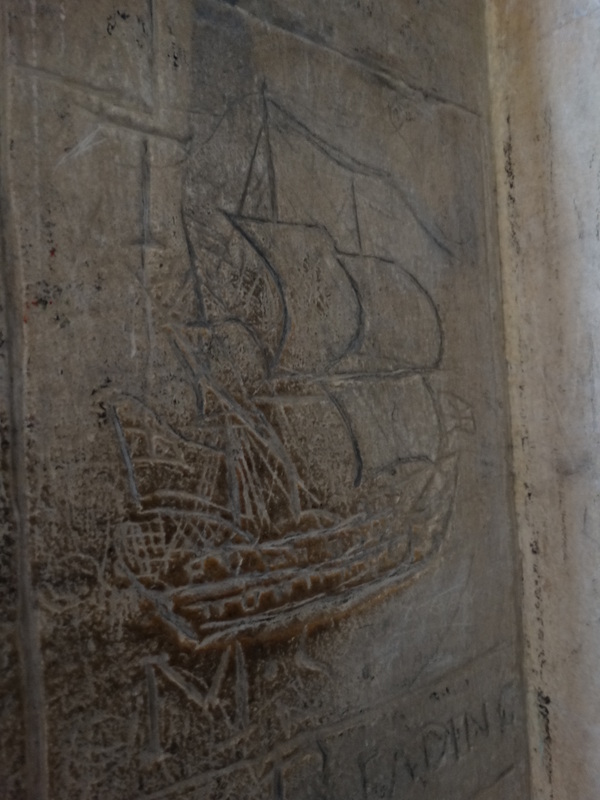 Today I was shown the tomb on the right, and a wonderful piece of graffiti. 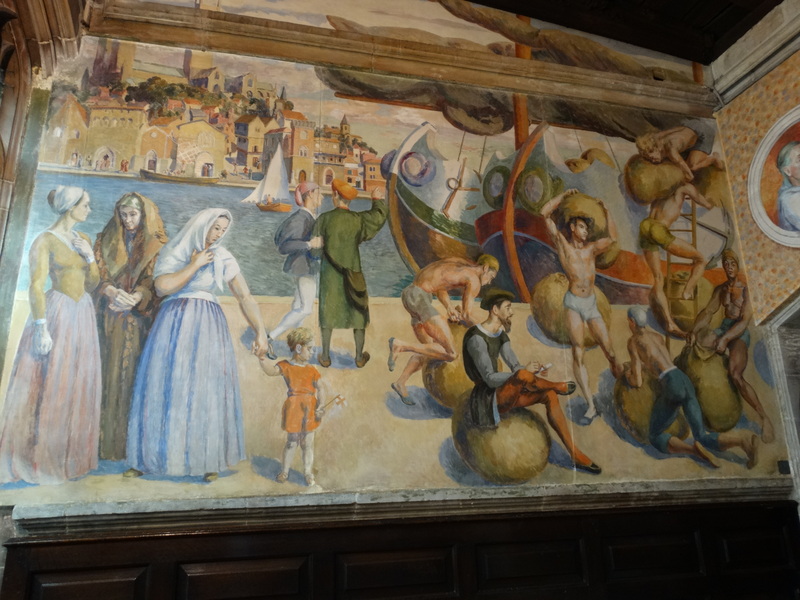 (If you want to find it, it is where the lady is standing (I hope she doesn’t mind being on my blog). In the south chapel is a new statue of Mary and Jesus by Aidan Hart. The Dean says “This sculpture will draw many to reflect upon the obedience and trust that Mary displayed when called to be part of God’s redeeming work” – I just thought, “I don’t like it”! 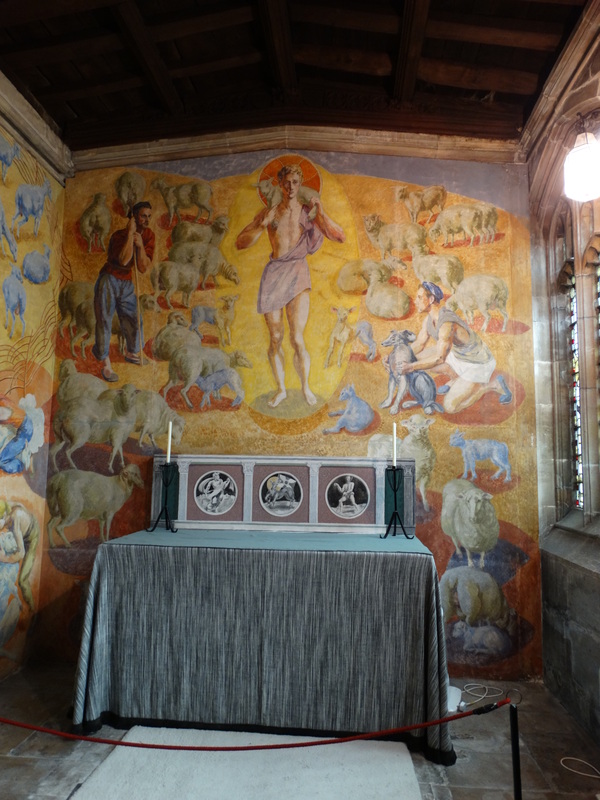 I do like the Duncan Clerk murals painted in the Russell Chantry at the end of the 1950s – the theme of the Good Shepherd and the Wool trade. This blog post is becoming long … what else is worth mentioning? 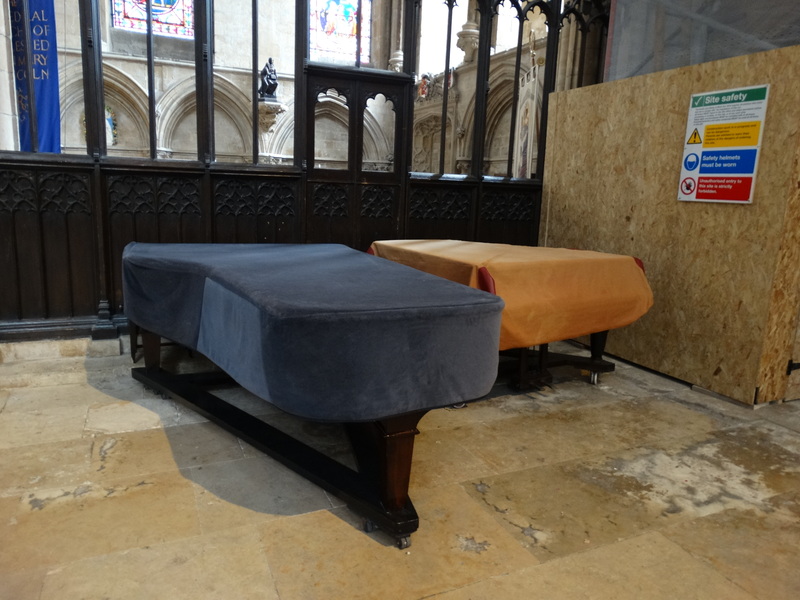 In the south transept we have lovely chapels with banners for Hugh and Paulinus (we’ll save Paulinus for the moment), and a breeding pair of pianos. This window is the Bishop’s Eye, looking south to where the Bishop’s Palace was. The statue is of Bishop Edward King. Back in the centre we look up to the Tower, before going outside to the cloisters and seeing the real thing. 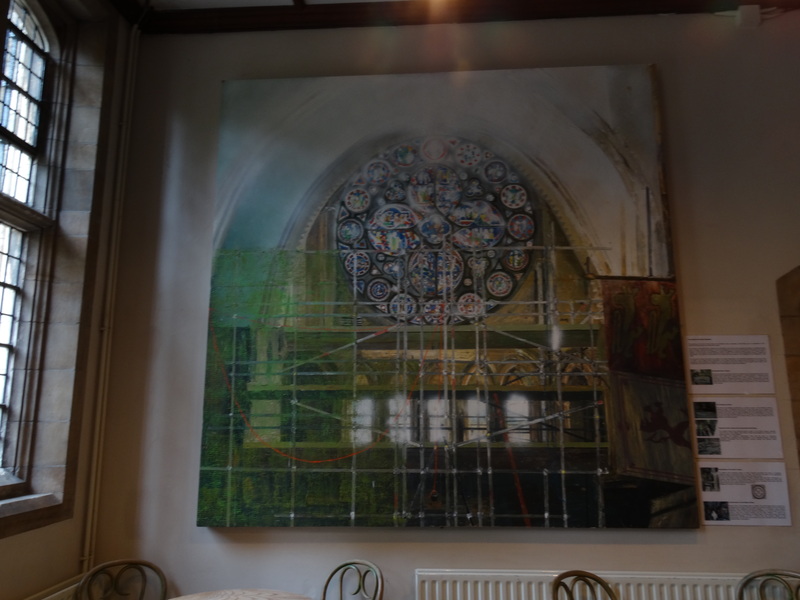 We have a look at the Dean’s Eye, the window in the north transept, and the painting (by Alan Parker) of the restoration that they need to do (this is hung in the Refectory). 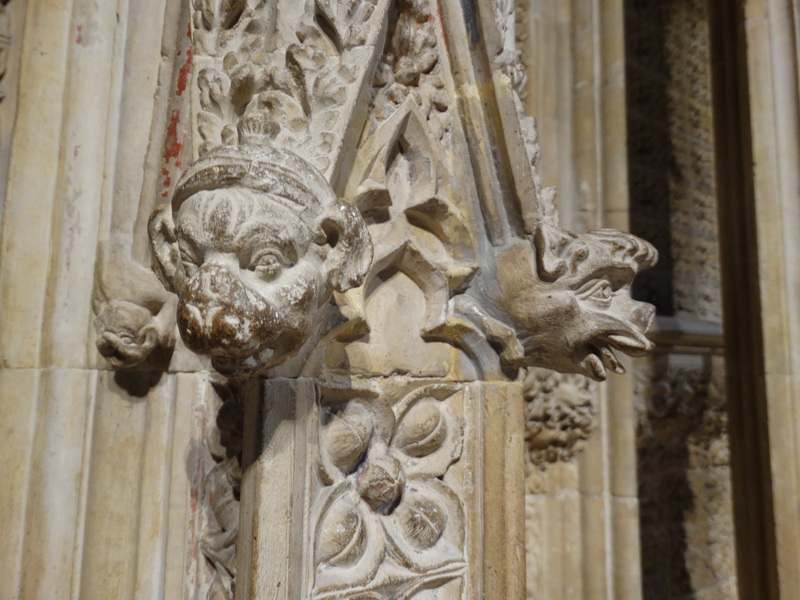 In the Refectory my kids would steal the chocolate biscuits set out for Cathedral coffee, in the Cloisters the devil sat on Julie’s lap (during a performance of the Mystery Plays) and asked for her phone number. I should add the Military Chapels, the Chapter House, the lovely corbels in the new loos, the historic library, the Roman mosaic … we will end with a new memorial, new since my day. 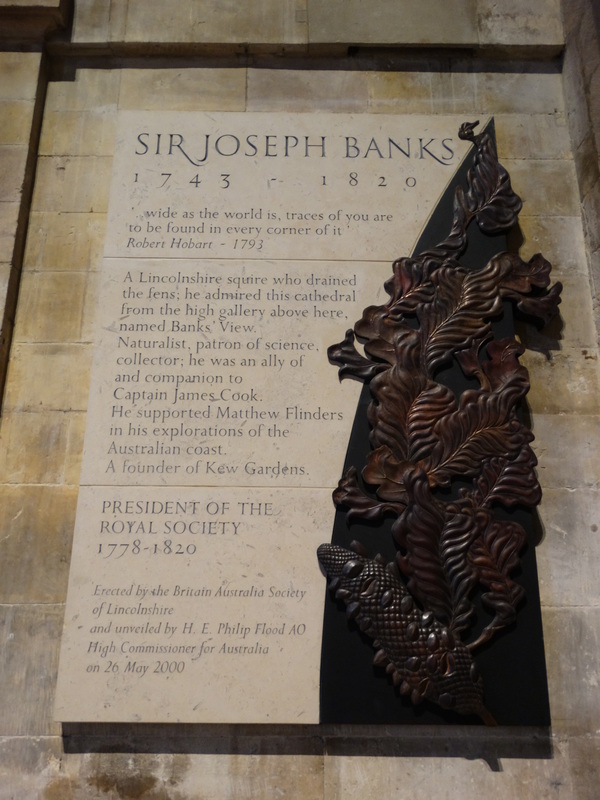 Sir Joseph Banks, explorer, biologist – find out more on the Natural History Museum website is now memorialised by the main door. A man who travelled the world, and loved this Cathedral – what better way to end? 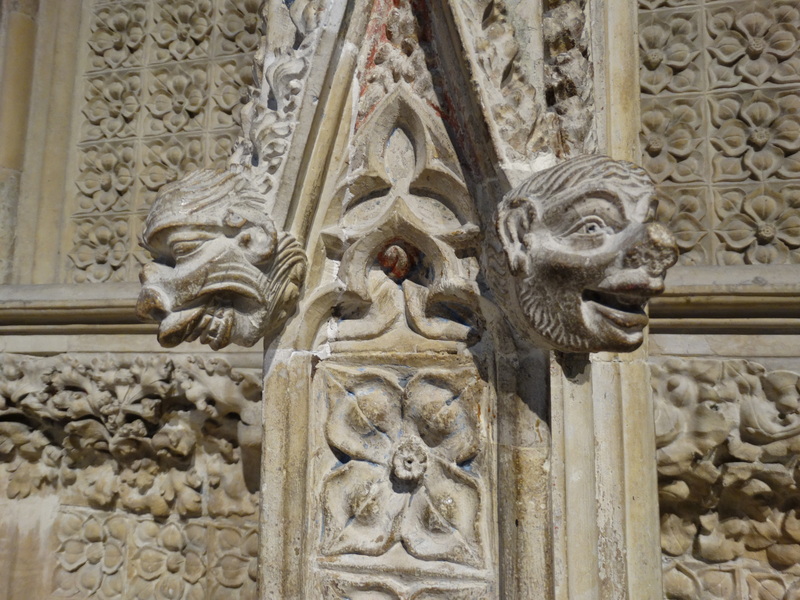 This entry was posted in Cathedral, Lincolnshire, Outside Northumberland, Personal. Bookmark the permalink. 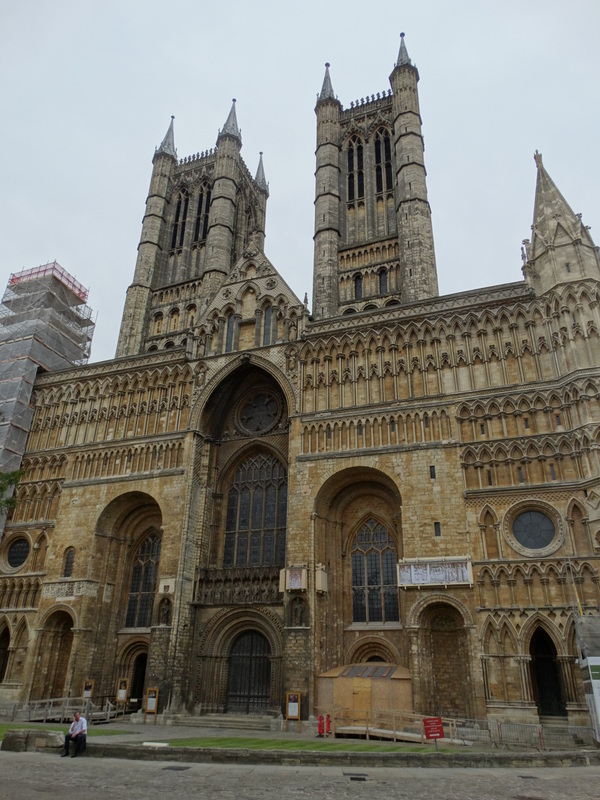 I was at Lincoln Cathedral School from 1970 to 1972, (aged 9 to 11). The school was connected to the Cathedral via a door in the cloisters. 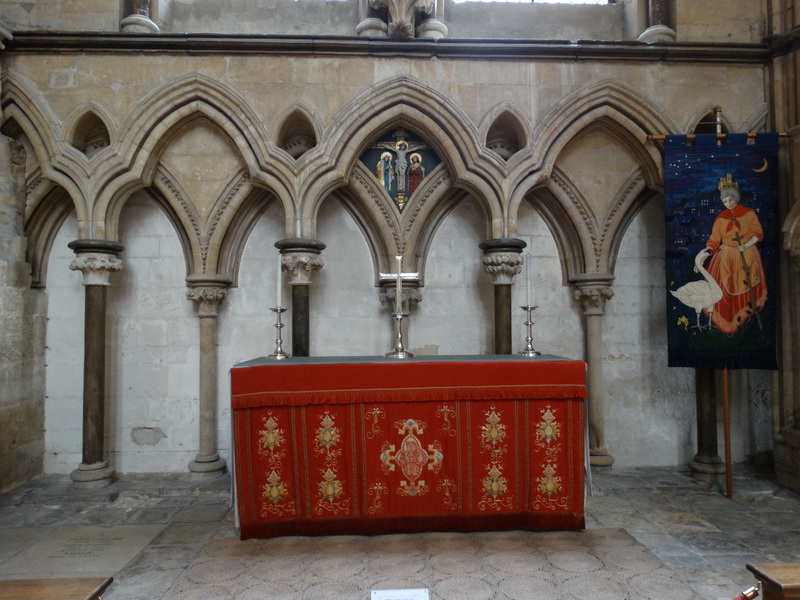 We had prayers in the Chapterhouse every morning and the school provided all 16 boy trebles to the choir. The choristers worked hard, almost daily practice. I was not one. It was a fee paying prep school for boys but choristers went for free. The bells chimed every 15 minutes to tell you the time which was nice during boring lessons, and Vulcan bombers were always screeching in the skies above, taking off or landing at Scampton. They had ceased to carry atom bombs by 1969 (went to missile defence) but they were still very present. Our playground abutted the nave, and to stand against it, and look up the towering walls rising vertically above me is a memory I will never forget. Awe inspiring. There were always scaffolding planks lying around from constant renovations to the building which allowed me to build a giant personal “hut” for my breaktime. Lasted a couple of days before I got a bollocking and had to dismantle it. 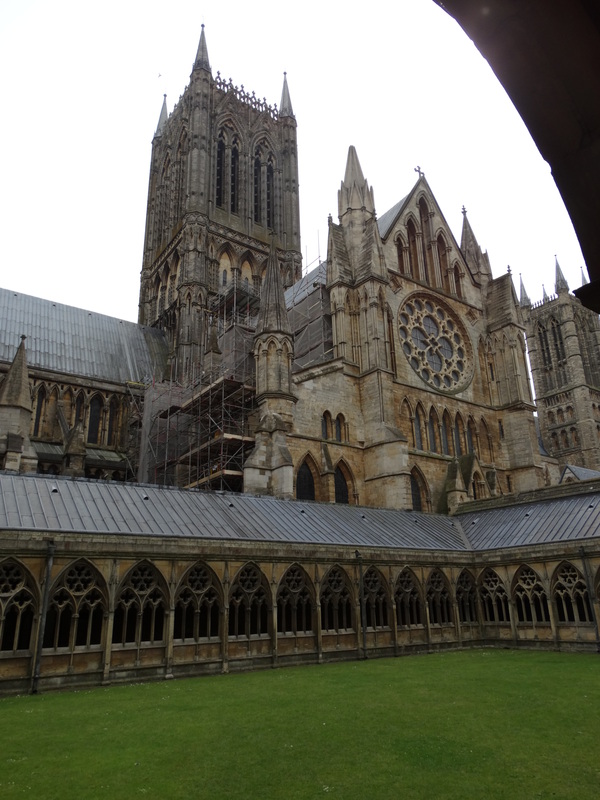 Dear Peter: A couple of months ago I visited Lincoln Cathedral. I was very pleased to see that it now houses two contemporary pieces of sculpture. The Forest Stations I thought splendid. The Statue of the Blessed Virgin Mary I looked at it for some time, and I was glad to be able to take some pictures home to look at it further. I like and admire it. However, my sister did/does not like it and I see that you reacted to it in the same way. I wonder if you would be willing to give a little more detail to your reaction – I would find it helpful in gauging my own reaction. Dear Peter: Thank you for your reply which is very helpful. 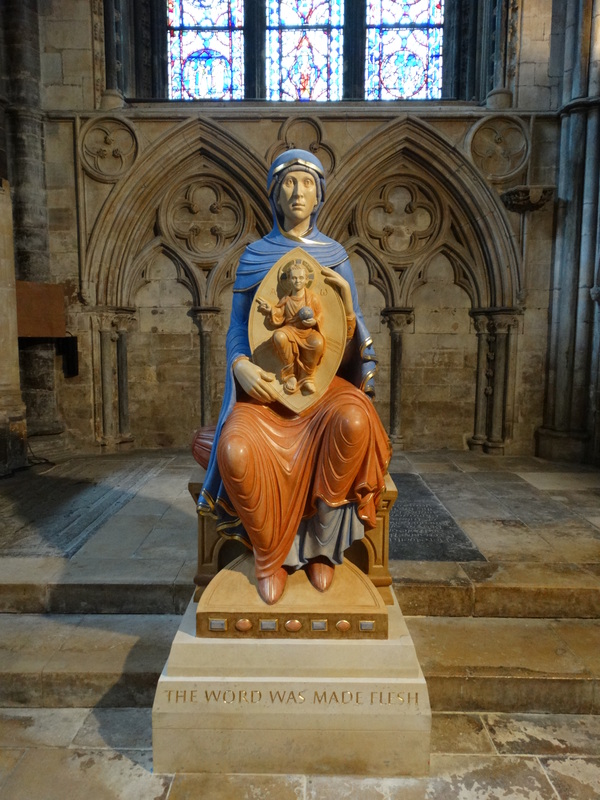 I wonder if you have read the transcript of an interesting lecture the sculptor gave about the making of the statue, which I was able to access through the cathedral website.